Sunflower is the common name for any of the plants of the genus Helianthus of the flowering plant family Asteraceae (known as the aster, daisy, or sunflower family). It also commonly is used specifically in reference to the annual plant Helianthus annuus, the common sunflower, which is characterized by a long stem and a large flowering head (inflorescence) with large seeds. The term sunflower also refers to this plant's seed-like fruit (commonly but incorrectly called the seeds) or the encased, edible, true seeds. The adaptation that allows sunflowers to advance their own individual purpose of reproduction, the "flower head," also contributes larger value for the ecosystem and for humans. Ecologically, sunflowers are copious nectar producers, providing food for pollinating bees, while the seeds and leaves provide food for such animals as birds, insects, and squirrels. For humans, all parts of the plant are used. The seeds of the common sunflower are eaten and are a source of a valuable oil (one of the most important vegetable oils). The leaves and stalks are used as fodder for livestock, and the flowers yield a yellow die. Overall, the common sunflower, with its flowers of various colors (yellow, maroon, orange, etc. ), is a popular ornamental plant for gardens. The family Asteraceae, to which Helianthus belongs, is known as the aster, daisy, or sunflower family. It is a taxon of dicotyledonous flowering plants. The family name is derived from the genus Aster and refers to the star-shaped flower head of its members, epitomized well by the daisy. 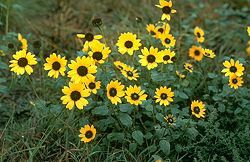 In addition to the sunflower and daisy, other well-known members of the family include lettuce, chicory, globe artichoke, safflower, chrysanthemums, ragwort, and dandelion. The genus Helianthus L. comprises more than fifty species of sunflowers, all of which are native to North America, with some species (particularly Helianthus annuus, common sunflower, and Helianthus tuberosus, Jerusalem artichoke) cultivated in Europe and other parts of the world as food crops and ornamental plants. 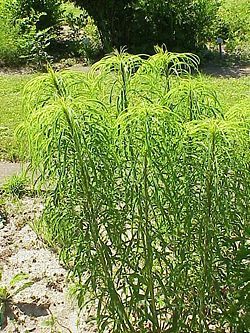 Members of this genus usually are tall, annual or perennial plants, growing to a height of 60-390 centimeters. The rough and hairy stem is branched in the upper part. The petiolate leaves are dentate and often sticky. The lower leaves are opposite, ovate, or often heart-shaped. The upper leaves are alternate and narrower. They bear several to many wide, terminal capitula (flower heads), with bright yellow ray florets at the outside and maroon disc florets inside. These flower heads follow the direction of the sun, going from east to west during the day. Helianthus annuus, the common sunflower, is an annual plant native to the Americas, with a large flowering head (inflorescence). The stem of the flower can grow as high as 3 meters tall, with the flower head reaching up to 30 centimeters in diameter with the "large" seeds. It is the most widely distributed on the sunflower species, being introduced from the Americas into Europe in 1510 by the Spanish and now grown on all continents except Antarctica (Bender and Bender 2005). It is an important source of edible oil and the seeds are used for food as well. Sunflowers most commonly grow to heights between 2.5 and 3.5 meters (8 - 12 feet), with a rough, hairy stem. 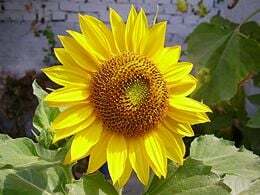 Scientific literature reports, from 1567, that a 12 meter (40 feet), traditional, single-head, sunflower plant was grown in Padua. The same seed lot grew almost 8 meters (24 feet) at other times and places (e.g. Madrid). Much more recent feats (past score years) of over 8 meters (25 feet) have been achieved in both Netherlands and Ontario, Canada. The common sunflower also has large (up to 12 inches long), broad, toothed, leaves. Sunflowers are extremely variable, with the species encompassing both wild and domesticated plants, and with the domesticated plants varying from a single stem with a very large head to plants with a few branches and somewhat smaller heads (although larger than the wild variety). What is usually called the flower is actually a head (formally composite flower) of numerous flowers (florets) crowded together. The outer flowers are the ray florets and can be yellow, maroon, orange, or other colors, and are sterile. The florets inside the circular head are called disc florets. The disc florets mature into what are traditionally called "sunflower seeds," but are actually the fruit (an achene) of the plant. The true seeds are encased in an inedible husk. The florets within this cluster are arranged spirally. Typically, each floret is oriented toward the next by approximately the golden angle, producing a pattern of interconnecting spirals where the number of left spirals and the number of right spirals are successive Fibonacci numbers. Typically, there are 34 spirals in 1 direction and 55 in the other; on a very large sunflower you may see 89 in one direction and 144 in the other. Sunflowers in the bud stage exhibit heliotropism. At sunrise, the faces of most sunflowers are turned towards the east. Over the course of the day, they move to track the sun from east to west, while at night they return to an eastward orientation. This motion is performed by motor cells in the pulvinus, a flexible segment of the stem just below the bud. As the bud stage ends, the stem stiffens and the blooming stage is reached. Sunflowers in the blooming stage are not heliotropic anymore. The stem has frozen, typically in an eastward orientation. The stem and leaves lose their green color. The wild sunflower typically does not turn toward the sun; its flowering heads may face many directions when mature. However, the leaves typically exhibit some heliotropism. 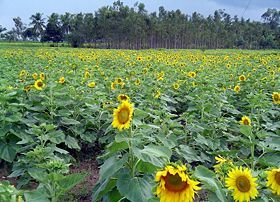 A sunflower farm near Mysore, India. 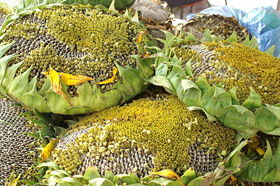 Sunflower heads sold as snacks in China. Sunflowers are native to the Americas. There is some debate about where the sunflower was first domesticated. The earliest known examples of a fully domesticated sunflower were found at the Hayes site in Tennessee and date back to around 2300 B.C.E. There were also other remains found at the Olmec site of San Andrés dating some time before 2100 B.C.E. The Incas used the sunflower as an image of their sun god. Gold images of the flower, as well as seeds, were taken back to Europe early in the sixteenth century. To grow well, sunflowers need full sun. They grow best in fertile, moist, well-drained soil with a lot of mulch. In commercial planting, seeds are planted 45 centimeters (1.5 feet) apart and 2.5 centimeters (1 inch) deep. Sunflower "whole seed" (fruit) are sold as a snack food after roasting within heated ovens, with or without salt added. Sunflowers can be processed into a peanut butter alternative, Sunbutter, especially in China, Russia, the United States, the Middle East, and Europe. It is also sold as food for birds and can be used directly in cooking and salads. Sunflower oil, extracted from the seeds, is used for cooking, as a carrier oil (used to dilute essential oils and absolutes before they are applied to the skin, such as in soap), as a lubricant, as an ingredient in paint, and to produce biodiesel. A range of sunflower varieties exist with differing fatty acid compositions; some "high oleic" types contain a higher level of healthy monounsaturated fats in their oil than even olive oil. During the eighteenth Century, the use of sunflower oil became very popular in Europe, particularly with members of the Russian Orthodox Church because sunflower oil was one of the few oils that was not prohibited during Lent. The portion of the plant remaining after the seeds have been processed for oil is used as a livestock feed. Some recently developed cultivars have drooping heads. These cultivars are less attractive to gardeners growing the flowers as ornamental plants, but appeal to farmers, because they reduce bird damage and losses from some plant diseases. 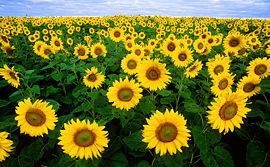 Sunflowers also produce latex and are the subject of experiments to improve their suitability as an alternative crop for producing hypoallergenic rubber. For farmers growing other crops, the sunflower is considered a weed. The wild variety will grow unwanted in corn and soybean fields and can have a negative impact on yields. Illustration of Vogel's model for n=1..500 .
where θ is the angle, r is the radius or distance from the center, and n is the index number of the floret and c is a constant scaling factor. It is a form of Fermat's spiral. The angle 137.5° is related to the golden ratio and gives a close packing of florets. This model has been used to produce computer graphics representations of sunflowers (Prusinkiewicz and Lindenmayer 1990). Sunflower seeds in many variations and sizes. Pope, K., M. E. Pohl, J. G. Jones, D. L. Lentz, C. von Nagy, F. J. Vega, and I. R. Quitmyer. 2001. Origin and environmental setting of ancient agriculture in the lowlands of Mesoamerica]. Science 292(5520): 1370 - 1373. Prusinkiewicz, P., and A. Lindenmayer. 1990. The Algorithmic Beauty of Plants. Springer-Verlag. ISBN 9780387972978. Shosteck, R. 1974. Flowers and Plants. An International Lexicon with Biographical Notes. Quadrangle/The New York Times Book Co. ISBN 0812904532. Wood, M. 2002. Sunflower rubber?. USDA Agricultural Research Service. Retrieved September 24, 2007. This page was last modified on 2 April 2008, at 17:13.